Folks are encouraged to bring their own chairs or blankets and enjoy all The Shoppes have to offer. 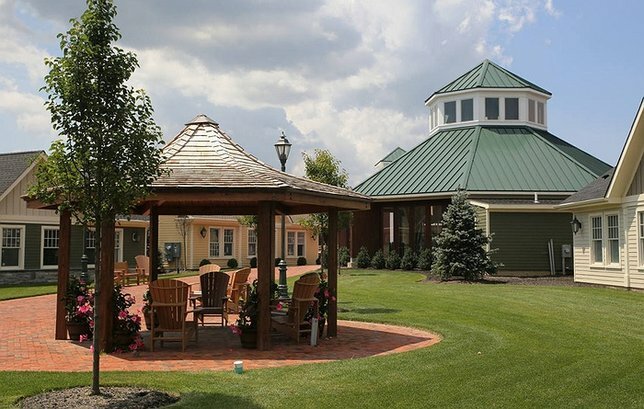 The Shoppes Summer Family Entertainment Series will take place under the gazebo in the courtyard. The series will take place under the gazebo in the courtyard at The Shoppes at East Wind and folks are encouraged to come early visit The Shoppes, bring their own chairs or blankets and enjoy all The Shoppes have to offer. "We enjoy seeing families getting together for some fun and leaving their often-stressful days behind. The entertainment is superb and there is something for everyone. The carousel, Brezza's Pizza, Tweet's ice cream shop as well as all the other family-owned shoppes complete the picture for a laid back, entertaining night. Bring your lawn chairs, sit back, and relax!!" says Mona Rossero of The Crushed Olive. Live at the Shoppes, family entertainment doesn’t stop there – additional summer fun includes, Cruise Nights on Tuesdays at 5:30 PM from July 10th – August 21stand Wednesdays August 29th – September 5th. Little Miss Sew It All's Summer Program, Project Funwaytakes place from July 9th through August 17th, a week long sewing class culminating with a Once Sew-pon a Time Fairytale inspired student fashion shows every Friday evening in the courtyard. North Fork Craft Gallery features one of their local artisans at an outdoor experiential activity every Sunday from 1:00 to 5:00 pmthrough August 26th. The Painted Canvas hosts weekly summer camps for kids July 9th – August 23rdand Open Paint Days for creative families nearly every Saturday, 12 noon to 4:00 pm.You can find other exciting events listed on our Facebook page. Located at the gateway to Long Island’s North Fork wine trail, East Wind Long Island is set on 26 lush acres and is home to 50 grand rooms and suites, a 10,000-square-foot lavish and tranquil full-services spa, and salon, and an award-winning catering facility with more than 50,000-square-feet of indoor and outdoor banquet, weddings, event, meeting, retreat, and conference spaces. The Inn also features a 24-hour fitness center, an indoor swimming pool, Desmond’s a 200-seat restaurant featuring breakfast, lunch, dinner, and Sunday brunch. EastWindLongIsland.com. People's United Bank, N.A. is a subsidiary of People's United Financial, Inc. (NASDAQ: PBCT), a diversified financial services company with $44 billion in assets. People’s United Bank, founded in 1842, is a premier, community-based, regional bank in the Northeast offering commercial and retail banking, as well as wealth management services through a network of over 400 retail locations in Connecticut, New York, Massachusetts, Vermont, New Hampshire and Maine.Visit us at peoples.com. Summer Bucket List 2014: Enjoy All of the Best Long Island Fun this Season! Subject: LongIsland.com - Your Name sent you Article details of "Grammy Nominee, Brady Rymer, Como Brothers and Others Perform at 2nd Annual Live at The Shoppes Summer Family Entertainment Series"